End of monsoon usually marks the beginning of what we call, the “Festive season” in India. Every state, every place has a grand festival to celebrate. Today, I want to talk about the festival that is very close to my heart. For me as a Bengali, Durga Puja has always been the biggest and most important festival of all and it is not only a festival, because it is a buzz that starts two months before the main 5 days. Those 5 days are nothing less than a carnival! Everyone wakes up to the sound of dhak flowing in through the windows. The scent of dhunuchi and incense sticks all around the pandal, people sincerely waiting every morning for the Pushpanjali to start and the bhog to be served afterwards. The restlessness one feels to go for pandal hopping during Puja is something one can understand only after experiencing it! The rush you feel standing among thousands of people, the Grandeur, the over the top decorations, the time artists and sculptors invest, oh the feeling! It is nothing that can be described with words! I have grown up in a place where these 10 days are predominantly celebrated as Navratri. The same goddess is worshipped in a different form and the people celebrate in a different manner! It is grand all the same, but yes, a little different! But, there is another thing in common! Dressing up and feeling your best! 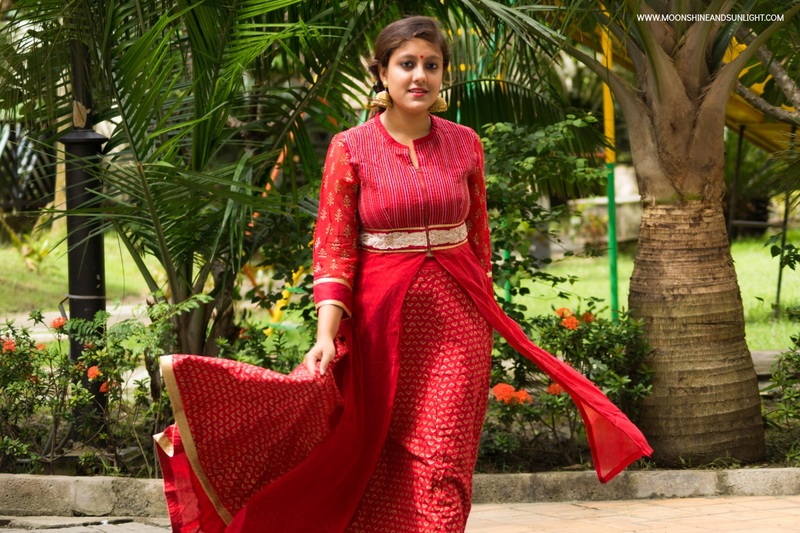 You can be celebrating Durga Puja and going Pandal hopping or celebrating Navratri and enjoy playing Dandiya all night, but you will be doing that dressed up in beautiful festive clothing, I am sure of that! 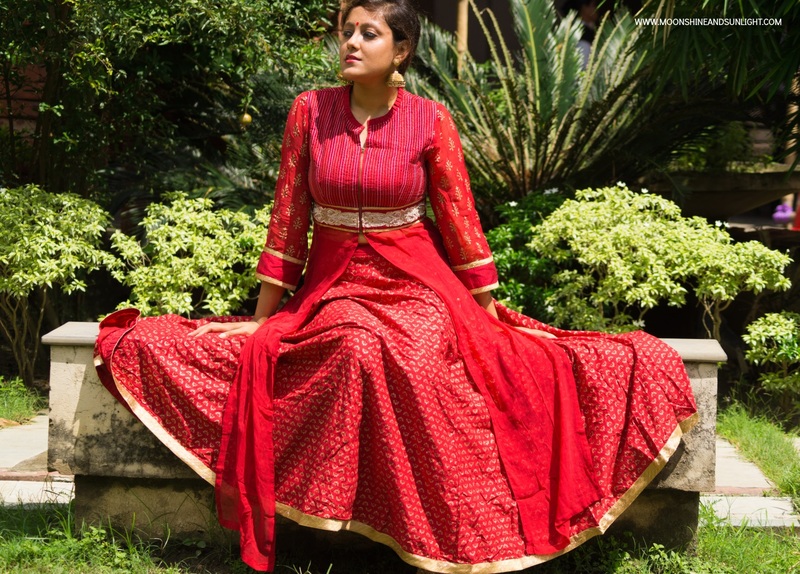 Hence, I bring you the festive collection by one of my favorite Indian wear brands, BIBA. 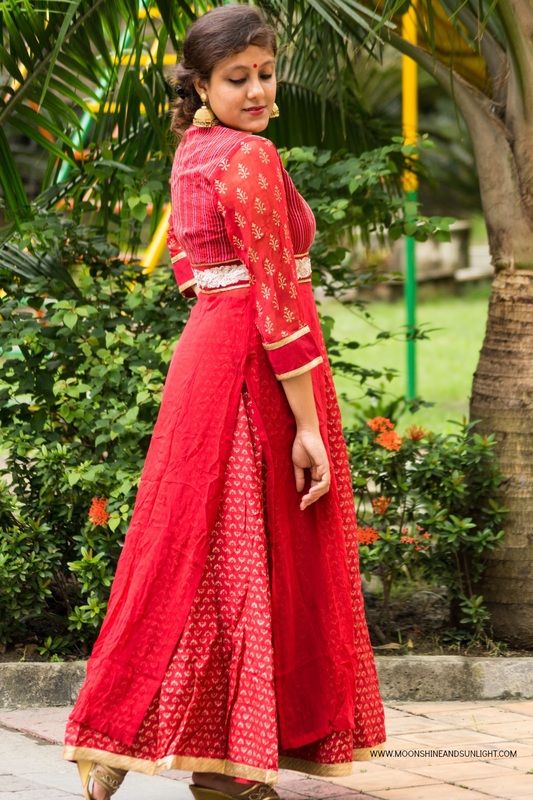 The festive collection by BIBA has beautiful pieces for you to feel good in! They believe in you feeling good in the clothes they have to offer, they believe that it is YOU, who will make the clothes look better with your personality and confidence! This collection has outfits in a variety of colors, from pure whites to pretty pastels to fiery oranges and beautiful reds! 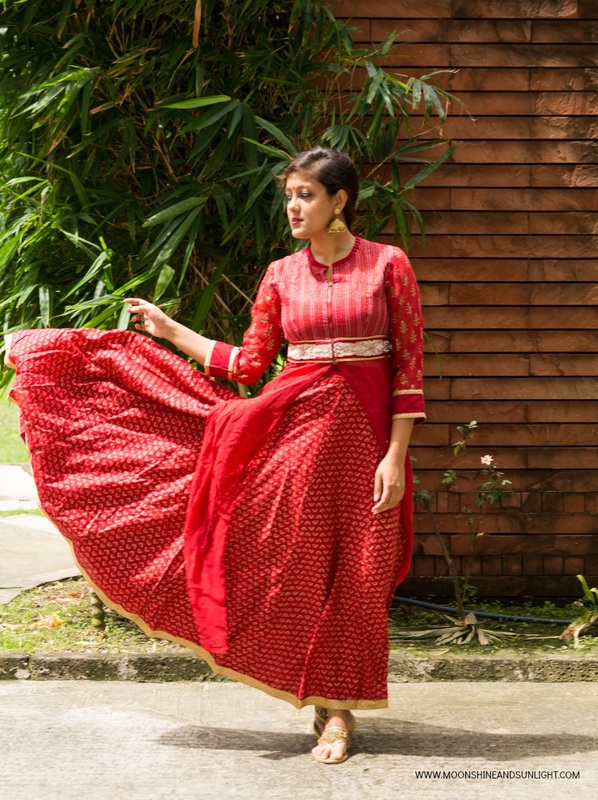 And the outfits are mostly available in trendy Indian silhouettes, but you can find classic outfits as well! I particularly liked a Pastel green anarkali with gold embroidery, but I loved this outfit more. 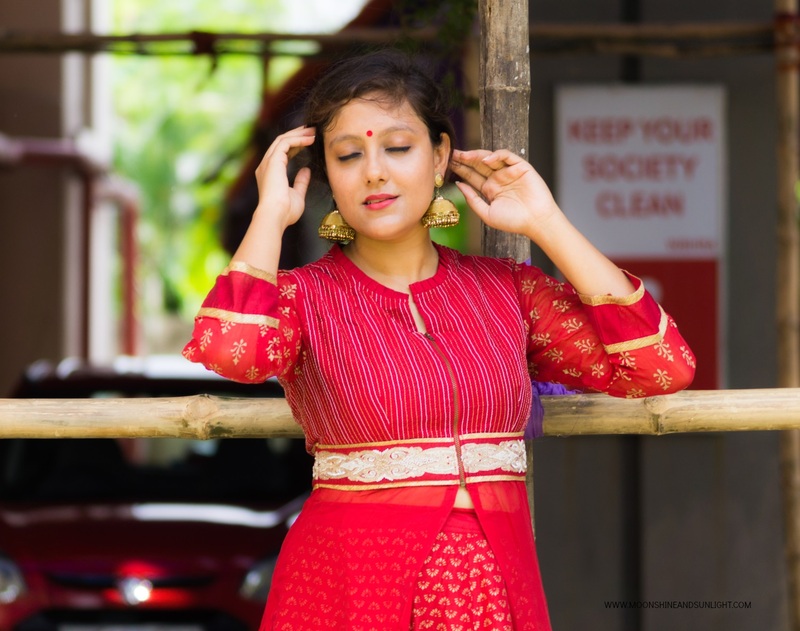 The red long top and lehenga skirt set caught my attention because of the zipped top and the beautiful fiery red color, which is perfect for wearing on Ashtami! I kept the look simple with just a big golden jhumka to compliment the gold prints on the lehenga and the embroidery on the top. The outfit was beautiful enough to make me feel the same on its own! 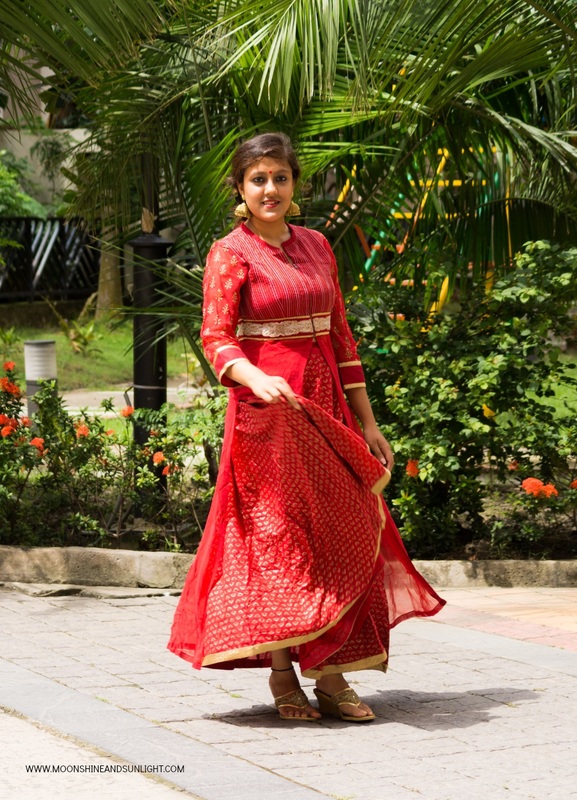 Do check out the festival collection of BIBA and let me know your views! Also let me know what you think about this outfit! Have a Joyous and lovely Durga Puja and Navratri! And those Jhumkas.. That's what I need in my life. I love love love love the earrings!! I need them in my life! What a treat to the eyes!!!!! Hope you have an amazing Pujo love! It's been a part of my childhood too and I always look forward to it every year! I adore jewellery so much! I also like jewelry on men, but not too much of it. I've recently seen beautiful men's pendants on https://gold24.in/products/gold-golden-mens-pendants . Want to buy one for my hubby! Love the outfit.. looks so gorgeous. 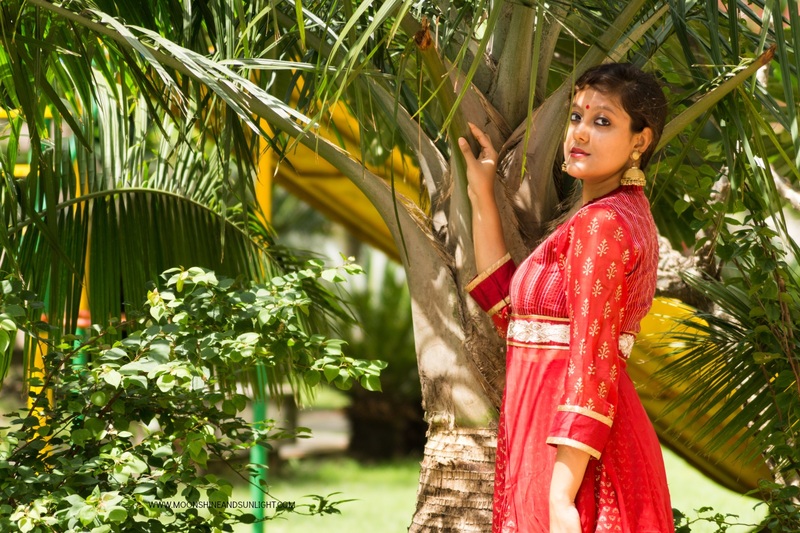 SO pretty you look Priyanjana!